Liferay bundles contain the same directory structure regardless of application server. The top-level folder is named for the release of Liferay. 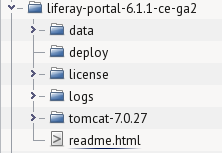 This folder is called Liferay Home and we refer to it thoughout this documentation. Data: This folder is used to store the embedded HSQL database which the bundles use, as well as the configuration and data for the Jackrabbit JSR-170 content repository and the Lucene search index. Deploy: Plugins which you wish to deploy to Liferay can be copied into this folder. It is also used by Liferay Marketplace and Liferay’s graphical plugin installer utility. [Application Server]: The name of this folder is different depending on which bundle you have downloaded. This folder contains the application server in which Liferay has been installed. Unzip the bundle to a location of your choice. If you’re setting up Liferay to be an actual server, copy your database’s JDBC driver .jar to [Tomcat]/lib/ext (see the setup wizard section below). If you’re setting up Liferay for demo purposes, you can skip this step. Once Tomcat has completed its start up, it automatically launches a web browser that displays Liferay’s setup wizard. If for some reason your browser doesn’t load the wizard, launch your web browser and then go to http://localhost:8080. Liferay CE ships with a sample web site that showcases Liferay’s features. It contains many links describing the features of Liferay that we’ll cover in detail throughout this book. If you’re installing Liferay on your own machine to explore its features, you likely want to leave the sample site there so you can examine it. If, however, you’re installing Liferay on your server to run your own site, it’s best to start with a clean system. Before running the setup wizard, you should remove the sample data from your Liferay installation. You must do this before running the setup wizard to get a clean database, and it’s as simple as undeploying the applications that install the sample data. To remove them, all you have to do is undeploy them. The method for doing this differs by application server and that, of course, depends on the bundle you have chosen. For example, on Tomcat you delete the application folders from the [Tomcat Home]/webapps folder. On Glassfish, you use the administrative console to undeploy them. If you forget to undeploy the sample applications before you run through the setup wizard and connect Liferay to your real database, the sample data is created in your database, and you won’t have a clean installation. Make sure you get the sample data undeployed before setting up your server. If you’re using Liferay EE, you don’t have the sample site so you don’t need to worry about this. The next step is to run through the setup wizard, which we’ll cover below. As you can see, bundles are the easiest way to get started with Liferay. They come pre-configured with a running Liferay instance that can be used immediately to explore all of the things that Liferay can do. Bundles are the fastest way to create full production-ready Liferay installations. If you’re using a bundle, skip to the section on the setup wizard below to continue your installation. Of course, it’s not always possible to use a bundle. You may already have an application server upon which you want to install Liferay. The bulk of this chapter describes how to install Liferay on all the application servers it supports, both open source and proprietary.